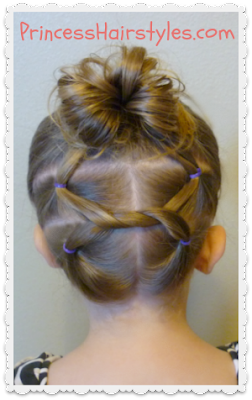 2 cute and easy hairstyles for gymnastics, sports, dance, etc. For short hair, as well as long! Hey guys! Our video tutorial this week features two simple hairstyles made using "shoelace knots." These styles should work great for those of you with toddler or baby hair, thin hair and short hair! 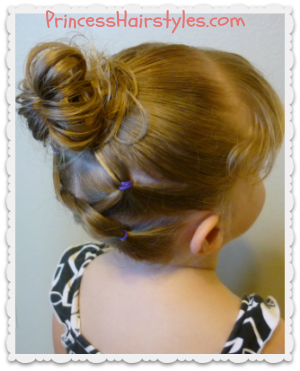 The first option (with a shoelace knot in the back and bun on top) would be a pretty hairstyle for sports, dance, swimming, gymnastics, figure skating, or school. The elastics help to hold the hair in place, so it's less likely to fall out of the ponytail (as shorter hair tends to do sometimes.) This is also more of a grown up look compared to the pigtail variation below. And even though my darling 2yr old niece is modeling this hair style... I think it would be cute on older girls as well as toddlers! Previously we have done a "backwards french braid" starting at the neck, heading up into a ponytail (or bun) which is a popular look right now. These knots are a good alternative for those of you who don't know how to french braid, don't have time to french braid.... or you have a daughter who isn't very excited about flipping her head over while you braid! There are many variations that can be done using these knots. If you want to leave the hair mostly down, you could make the 4 little ponytails on top with the knot in the center and leave the rest of the hair as it is. (Which is basically what you can see from our picture above.) Or, you could put the rest of her hair into a ponytail, pigtails, or bun. As you will see in our video, we actually made a knot at the top of her head and at the back of her head before bringing the remaining hair into pigtails. If the hair you are working with is long enough, you could made a series of knots all the way down her head if you want to! Shoelace Knot Hairstyles Video Tutorial: Click here to watch the video directly on YouTube. The given hairstyles are so amazing.I like these hairstyles so much.You have done a effort here. 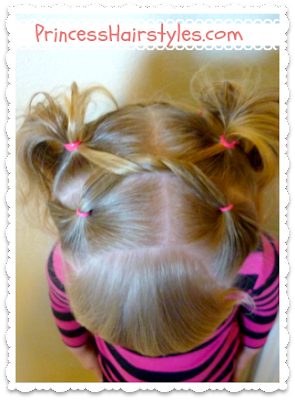 Wow, these look like great ideas for my smallest daughter with lots of fine babyhair that escapes most hairdos! I can't wait to try this on my daughter... she's 3 and a half with super fine shoulder length hair.. this will be perfect to keep it in check for school! totally just did this hair style on my daughter. She has long fine hair. It worked great. she looks totally adorable. We have tried a few of these on my grand daughter and they turn out great. Some have even held over night for a function the next day. I really liked this and thought it might work for my excessively busy 3 year old with ultra fine hair. After two hours it had almost completely fallen out (did I mention she's active?). Does anyone have suggestions for getting hair to stay put without giving her hair gel helmet head?